An estimated 500,000 disabled children are being excluded from South Africa's education system, US-based Human Rights Watch (HRW) says in a report. 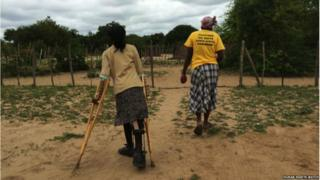 HRW says the government has discriminated against disabled children in its allocation of school places. Children are excluded from mainstream schools and forced to wait years for places at special schools, it says. The government said it was disappointed by the report, which "trivialised" efforts to help disabled children. In a statement, South Africa's Department of Basic Education said that HRW had failed to include the ministry's submissions to the final report. "It is almost as if there is an attempt to sensationalise the very real and very serious challenges faced by learners with special needs," it said. The department said it was " working at various levels of government to educationally enrich the lives of children with disabilities". But campaigners say the government needs to admit that it is not providing quality education to all of its children. "The job is not done until all children count just the same in the education system," said Elin Martinez, a children's rights researcher and author of the report. Human Rights Watch researchers also found that inadequate teacher training and understanding of children's disabilities meant children with disabilities were not properly treated in classrooms. In some cases, children suffered physical violence and neglect in schools, they added. A mother of an eight-year-old boy with Down's syndrome told HRW that her child was denied admission because of his illness. And parents of children with disabilities were often asked to pay additional fees, HRW said. The 94-page report from the international pressure group found that many adolescents with disabilities lacked basic life skills that should be taught in school and were facing difficulties in getting employment. In 2007, South Africa was one of the first countries to ratify the UN Disability Rights Treaty, which requires the government to promote an inclusive education system. HRW said the government should adopt a new policy and legislation that would ensure equal learning opportunities for people with disabilities. However, the education department said it was working hard to improve data-gathering and screening that would help children with disabilities to go to "neighbourhood schools and receive support in inclusive settings from an early age".